Korean Buddhists bow a lot. There are 6 bodily pathways that lead to suffering: eyes, ears, skin, nose, tongue, mind. There are 6 objects that lead to suffering: something you see, hear, feel, smell, taste, think about. There are 3 time periods in which you suffer: the past, the present, and the future. 108 sounds like a heck of a lot, I know. It is. And though it feels a little awkward at first, you get into a rhythm pretty quickly. The whole thing takes about 20 minutes. I've done 108 bows several times in templestays or at a meeting for Buddhist teachers that I was invited to. Every time, though, they put on a recording of a deep-throated man lyrically chanting 108 prayers in Korean over a meditative soundtrack made up of a flute and bird noises. Though I was told just to "focus on things you want to change in yourself", I always kind of wanted to know what the guy was saying. I didn't want to think I was bowing all along to commit my soul to Kim Yun-A or something (though I would. Oh GOD would I). Over the weekend I did another templestay at Golgulsa, and finally got an English copy of what (I think) the Korean man with the nice voice is actually saying. Some are more abstract than I would prefer (hard to focus on), and many are just not practical, but I imagine it still affects your mindset positively, much like visualization or repetition. My personal favorites are #8, 25, 31, 34, 50 and 104. I bow, uh, extra hard when those come up. I think it goes without saying that I love #11, too, because - let's be honest (Buddha wants me to be HONEST, right??) - I really, really love myself. Leave me a comment to tell me your favorites, or which prayers you wish Buddha had put on the "bow list". - Bowing is one way to purify myself. - Through bowing, I learn how to humble myself and how to have a healthy body and mind. - I bow to realize that others' lives are just as valuable as mine. - I bow to get rid of my selfishness. - I bow because it is the desire of my true self. - I bow for all living things, and for peace in the universe. 1. I bow to wonder where I came from and where I am and where I am going. 2. I bow to appreciate my parents for giving birth to me. 3. I bow to think about who I am. 4. I bow to find my true self. 5. I bow to always appreciate my body and spirit. 6. I bow for the well-being of my body and spirit. 7. I bow to think about my true desires. 8. I bow to find myself and to learn how to control myself. 9. I bow to appreciate the life I live today. 10. I bow to give thanks for being alive. 11. I bow to think about how much I love myself. 12. I bow to be able to always love my family. 13. I bow to feel happiness and peace of mind through love. 14. I bow to look for happiness only through love. 15. I bow to know that unchangeable love is flowing through the universe. 16. I bow to the teacher who has shown me the right way. 17. I bow to feel that love originates inside me. 18. I bow to reflect that my teacher's lessons are inside me. 19. I bow to feel that all living things, and the universe, are inside me. 20. I bow to remember that my ancestors and gods are inside me. 21. I bow to ask for forgiveness from the people I have hurt, because it hurts the whole universe. 22. I bow to take care of myself and not to do bad things. 23. I bow to rid myself of arrogance. 24. I bow to rid myself of false humility, even if I am in bad circumstances. 25. I bow to call attention to the good in others, but not the bad. 26. I bow to keep others' secrets. 27. I bow to rid myself of hatred of others. 28. I bow to rid myself of anger against others. 29. I bow to not repeat anything I have not heard. 30. I bow to not repeat anything I have not seen. 31. I bow to always be ready, but not to expect things to be easy. 32. I bow to avoid expecting obedience from others. 33. I bow to avoid expecting difficulty in my life. 34. I bow to make the best of each moment in my life. 35. I bow to live a righteous life. 36. I bow to repay even the smallest debt of gratitude. 37. I bow to not put my own needs over the needs of others. 38. I bow to not be stingy to others. 39. I bow to not harm others in order to get ahead. 40. I bow to try not to obtain valuable things with little effort. 41. I bow to have the power to control my desires. 42. I bow to reflect that life is more valuable than anything else. 43. I bow to know that suffering comes from an attached mind. 44. 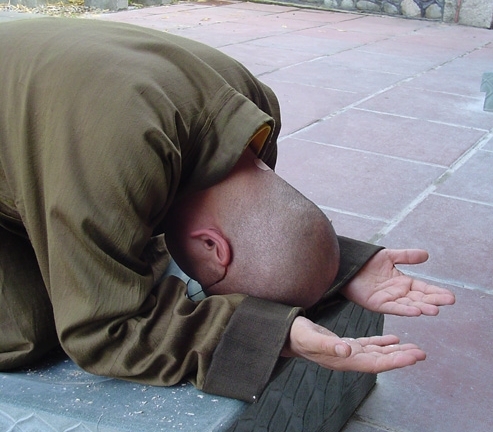 I bow to avoid making foolish mistakes out of ignorance. 45. I bow to try to attain deep wisdom. 46. I bow to learn to be nice to people, even if I have negative feelings toward them. 47. I bow to avoid clinging to the strong in order to hurt those who are weaker than me. 48. I bow to be honest with myself, and also to avoid flattering others. 49. I bow to be true and honest with myself above all others. 50. I bow to know that happiness, unhappiness, and desire are all within my mind. 51. I bow to know that happiness does not come from others, it comes from me. 52. I bow to realize the value of living a smooth, peaceful life. 53. I bow to avoid looking back at the past, and to not worry about the future. 54. I bow to own possessions, but not to be controlled by them. 55. I bow to know that I can find peace by being patient. 56. I bow to know that having a repentant mind is the best mind. 57. I bow to find freedom through wisdom. 58. I bow to control my mind, not to be controlled by it. 59. I bow to be diligent in my efforts to improve myself. 60. I bow to be thankful for the hard times I have had, because they have made me strong. 61. I bow to keep my original pure mind, even when time passes. 62. I bow to pray with a thankful mind for everything. 63. I bow to be thankful that I can find myself in silence. 64. I bow to reflect on the value of living a pure, honest life. 65. I bow for the people who are working in bad conditions. 66. I bow for the people who are starving, poor, and living hard lives. 67. I bow for the people who work to provide me with healthy food. 68. I bow to have a generous mind, even if I don't have enough for myself. 69. I bow for the precious lives of my children, who I have brought into the world. 70. I bow for my partner, who became one with me through love. 71. I bow for all disabled people. 72. I bow for friends who have been beside me, sharing my laughter and tears. 73. I bow for moderation, even when I have enough to waste. 74. I bow for a humble mind. 75. I bow for humility, so that I can always put others first. 76. I bow to realize that nature is being destroyed. 77. I bow to realize that all lives are interconnected. 78. I bow for all the lives destroyed by the greed of humanity. 79. I bow for all the ecosystems that are recovering after being hurt by humanity. 80. I bow to listen to the sounds of life that are all around me. 81. I bow to realize that my life is the movement of my soul. 82. I bow to realize that the object of love and longing is life. 83. I bow to feel my soul being purified when I hear the sound of a clean, clear stream. 84. I bow to give thanks for being able to hear and enjoy the beautiful songs of birds. 85. I bow to be refreshed by the feeling of a cool breeze. 86. I bow to be thankful as I breathe in fresh air. 87. I bow to be thankful for the sight of beautiful wildflowers that are always present. 88. I bow to give thanks for the mountains and landscapes that speak to me through wind and snow. 89. I bow to the Earth, which feeds all living things. 90. I bow to the sky, which gives life to all living things. 91. I bow for my own peace. 92. I bow to hope for peace in everything around me. 93. I bow for the peace of my neighbor. 94. I bow for peace within countries that have been separated for no reason. 95. I bow for peace between countries arguing for political reasons. 96. I bow for peace and harmony among all religions. 97. I bow to hope for peace in all dead and living things. 98. I bow to hope for peace between human beings and nature. 100. I bow for harmony between the poor and the rich. 101. I bow for harmony between the sick and the healthy. 102. I bow for harmony between those who have learned and those who have not. 103. I bow for those who have fallen into darkness. 104. I bow to accept all of the things I have done. 105. I bow to be thankful for all of the people who love me and take care of me. 106. I bow to be thankful for all of the good and beautiful things in my life. 107. I bow to be thankful for my life and to reflect on the lives that are yet to be. 108. I bow for myself, realizing that my own precious life is like the universe. and if you're still here, I'm thankful for you! I have seen the English version on the late night Buddhist TV network. This is the first time I have heard the Korean version. Thanks. oh really? i guess i need to watch more tv! every time i've flipped past the buddhist channel it's some bald guy in front of a chalk board. hey could you send me the mp3 with you reading the bows... i can't find it online complete anywhere. my address is hannah.gardi@gmail.com. thanks so much!! happy bowing. Thanks for this and your effort! I'm so happy to find the 108 bows in english thank you so much. Thanks for sharing. I also stayed at Golgusa and was wondering where I could get a copy of the bows in English - didn't think to ask while I was there. @Anonymous I tried to send you the mp3 but the email bounced back. Do you have another address I can send it to? Thanks a lot to you. Hi, I'm sooo happy to find this. Could you send me the mp3? badasori49@hotmail.com or badasori@web.de THOUSAND THANKS! Where is the number 51 explanation? Haha wow, I never noticed that it was missing! Here it is (I've also added it to the original post) - one of my favorites! Thanks to everyone who sent me their emails - I've stopped publishing emails of people who request the audio. I did 108 bows during my templestay in Korea. I like it very much. Thank you very much for compiling the words of 108 bows. - Sentient beings are numberless, we vow to save them all. - Delusions are endless, we vow to cut through them all. - The teachings are infinite, we vow to learn them all. - The Buddha way is inconceivable, we vow to attain it. Hello! I'm Korean (heehee) and my mom does this 108 bows thing every night. According to her, even though she isn't Buddhist (she's Catholic XD) this is good for your circulation.